The purpose of this test and file is to determine settings for different materials for marking and cutting with a CO2 laser system. There's always the test period.. This is a test file you can download to use to test materials to determine the ideal setting when using your laser system. We've included a materials log for you as well so you can track your materials and keep a record. All materials are different, there's no EXACT settings to do anything using a laser, as laser output varies with age, and even materials act differently in different atmospheric conditions. You'll find a chart of recommended starting settings for various types of wood below. Scroll through and follow the steps in the gallery below then proceed to the steps underneath as instructed on the last slide. After you import your Material Test File import the file into your RetinaEngrave or RetinaEngrave v2.0 software. You will have both bitmap (raster/engrave) and vector data available. In RE2, this will appear as two seperate objects. This object is .5 inches wide, and 1 inch tall. You can adjust this size if you wish. Position the material test design file (object) in a useable area of material. We usually mark the corner. To test for photo engraving, dither the object in the RetinaEngrave software. 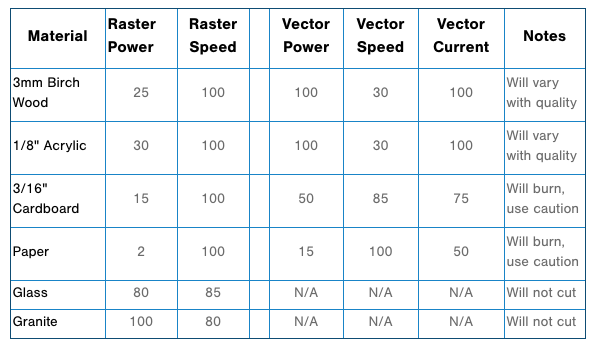 After dithering, use the chart below to adjust your speed and power settings. The black end of the test will represent the darkest areas, and the white end the lightest. Judge the gradient in the middle to make adjustments to the darkness of your engraving. Dithering isn't needed when testing for solid fill engravings. When testing for solid fill, simply set the black and white threshold on RetinaEngrave to adjust which colors are seen, and how much of the gradient is engraved. Use the chart below to adjust setting. More power and less speed will create deeper, darker engravings, while the opposite is also true. To test for vector cutting and marking, you'll be using the 4 different colored vector lines in the file. You will adjust the setting for each vector seperately, to see how different speed and power settings effect your material. Use the chart below to help pick your starting settings. The BLACK vector line is usually set where you KNOW the material will cut (or hope it will) and the other 3 dailed back. Ideally, you want to cut through the material with as little power and as much speed as possible. Scroll down for more steps! Analyze. Does your raster not look dark enough? Increase power, or decrease speed if you want it to look darker, or the opposite to achieve the same. Does your Vector Cut and Mark? Slower speeds and higher powers cut thicker materials. The cleaner line markings will happen at faster speeds (70-85%), deeper marks/cuts will happen at higher power, and/pr slower speeds. The longer the laser is in an area (the slower the speed) the more the material will burn, melt, or mold. Record and repeat. Repeat the steps as needed to dial in your material after making adjustments to the recommended settings. Keep a log of your jobs, so you can mimic your success, and avoid your mistakes. Soon, you'll be a laser cutting EXPERT. There are millions of materials, so use the guide to decide what settings would be a good starting point to dail yours in even if you don't see it below. Settings are based on a 45w laser tube, adjust accordingly for other size tubes. NOTE: Vector marking: start at 2-5% power and progress from there at 85% speed for bet results.